Thinking about getting an oscar fish and wondering what can oscars eat? Find out which foods are best for these cichlids, as well as how much and how often to feed them. 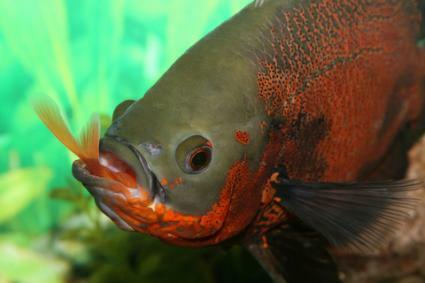 When shopping for commercial foods to feed your oscars, look for foods designed for cichlids. A large selection of pellet foods are available, as well as foods that are frozen, freeze-dried, or canned. Pellets come in different sizes and shapes to offer a selection for juvenile and adult oscars. When choosing pellets or other food for your pet, make sure the food is smaller than the fish's mouth. In the wild, oscars eat a varied diet which consists of a variety of insects and crustaceans. While oscars eat many types of live foods, not all live foods are good for them. Just as pellets come in different sizes, the size of the live food fed to your pet should be appropriate for the size of the fish eating it. Oscars need a balanced diet, so feeding them small fish is fine if you limit it to just a few fish a week. However, there are a few import tips to keep in mind. Always choose extremely healthy feeder fish. If these fish are sick or diseased, they can pass along diseases to your oscar, such as the disease known as "hole in the head." 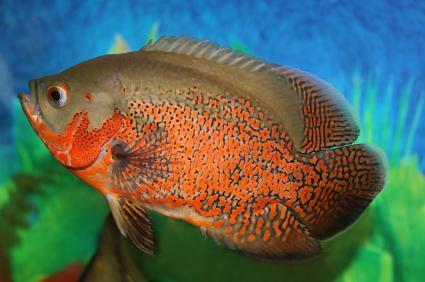 If you have difficulty getting healthy feeder fish, consider breeding your own. Guppies are prolific breeders and are often used as feeders. Feeder goldfish are not the ideal fish for an oscar's diet because they are prone to disease since they are typically kept in overcrowded tanks. If you must feed goldfish, be very selective and never purchase from a tank that contains any sick fish. It's important not to overfeed fish. Oscars have different needs based on their developmental stage. If your oscar measures less than four inches, it is a juvenile. These fish are fast growing, so smaller oscars need to eat more often. Fish less than four-inches long - Feed at least three times each day until the fish's stomach look somewhat rounded. Fish at least four-inches long - Feedings can be cut back to twice a day. Once an oscar reaches a year of age, it is considered an adult. Adults should not be fed more than once a day. In reality, most adults do well when fed about four days a week. This gives the digestive track a day to completely clear before feeding resumes. Test the water in the tank ; the pH should be between 6.0 and 8.0. Try a different type of food. If the water condition is fine, you've tried different food, and the oscar still won't eat, stop feeding your fish for a few days. Usually a healthy fish will start eating again when food is reintroduced. If you take these steps and your oscar continues to refuse to eat, talk to a veterinarian or your local aquarium shop expert. Feeding an oscar isn't as difficult as it may seem. You just have to keep all the factors in perspective. Always choose the highest quality food available. Feed a combination of live food and commercial food to ensure your pet gets well-rounded nutrition. Observe your pet when he eats, and remove any uneaten food two to three minutes after feeding so it doesn't foul the tank. Watch your pet's condition. If he looks fabulous and seems active, alert and healthy, you probably hit the right food combo and feeding schedule. These simple suggestions can help your oscar live a longer and healthier life.